In the two weeks since I posted last we celebrated Matt's birthday (in fact we're still celebrating! ), and I have finally received my flipper. I will take some photos soon. It is great. To now have the appearance of regular looking teeth is sweet! I have already planned a visit back to my preschool where I teach for Friday of this coming week. It was all a secret, so I was bursting, by the time we finally got in the car. On Monday the 15th, I told Matt that my flipper had come in (when it hadn't) and asked if he'd like to take me down. He agreed of course, and meanwhile I was secretly packing, arranging for the car, and I even pulled off meeting with the house owner to get the keys. Let me back up. 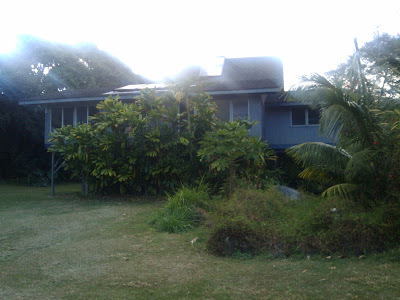 I planned along with my parents, & Matt's parents a two night, three day stay in Hana for Matt's birthday gift. So we got in the car to go get the rental when Matt thought I was getting my teeth, and instead we were off to the beautiful town of Hana on the Eastern side of Maui. It was simply beautiful. Our friends Danielle, and George came out for a night, and the following day, on Matt's birthday February 17th, we woke up, and Matt got a 2 1/2 massage from our friend Linda who came out to do it special for his birthday. 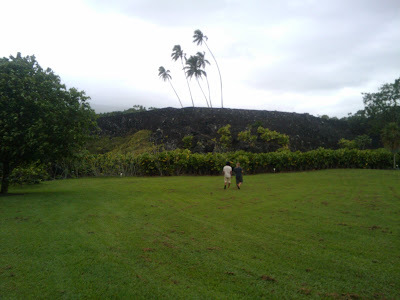 We then went to look at the largest heiau in Hawaii, called Piilanihale Heiau. It was incredible. 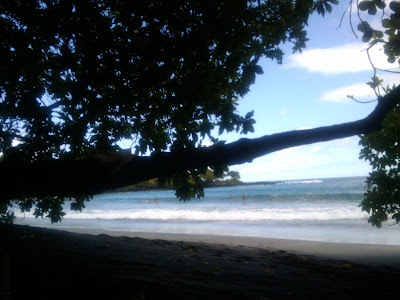 Lots of swimming at Hamoa beach, and just relaxing! It was heaven. We also recently hung up a piece of Matt's artwork at the new Whole Foods opening on February 24th. They are having a rotating art show, and Matt's friend Lanakila who did all the murals inside invited Matt, along with several other Maui artists. The program is unique to the Maui Whole Foods store. The artists, along with a scholarship fund will benefit from all art sales. Whole Foods is simply housing the artwork in an effort to tie to the community. It is a great project, and we are happy to be a part of it. So I'm totally siked to have my temporaries! I realized that I am only on month one of a nine month rebuilding process. When I look at it that way, I say I'm doing fabulous! It continues to be a struggle to eat, and open my mouth regularly. More diligence on my part is needed for me to pry my mouth open! I do exercises with tongue depressors to literally pry open my mouth. This is going OK, but I really have got to push it! Eating is coming along too. I can now eat rice, fish, eggs, and lomi lomi salmon and poi, without the aid of a blender. All soft foods are cool! Coming right along. I also recently discovered that I have received financial aid from the state. This is such a blessing. This will allow me more recovery time, as I am constantly reminded, it is needed. Just coming to the realization that I need to keep it slow still is a step in the right direction for me right now. My skin is still healing up, and I have to stay out of the sun until all my skin is healed completely. Time. Slowing it down. It's like a mantra for me really. Just slow it down. I have time to recover, so just take that time. Hmmm...take time on Maui. Sounds good to me. Welcome to the QUEST ACE Program. I love the ring of that. Indeed, I am eligible for coverage. What a relief. A giant sigh went across the pacific towards New Mexico, and back again. My parents are so pleased. Now I can again contact the various doctors offices tomorrow, and this time not explain that I am still waiting for my application to process, but that I have been accepted, and just have to enroll. That enrollment letter is going out in tomorrows mail! I am so thankful for the Outreach services at Maui Memorial Hospital. Without GiGi I would have been waiting a lot longer. My thanks also go to Valencia my case worker at Quest. Ms. Oliveros is another individual I would like to thank. You all have made this long process, not painful! Nice people who want to help, and are easy to work with. Last Thursday I had a nice surprise at Dr. Clarke's office. Only one extraction! I was told it would be two. I was also pleasantly surprised that my mouth did open up enough to take impressions. This was followed by more good news. My flipper may come back a lot earlier than I was previously told. I might get it this week! Woweee! I can't wait to start smiling again without bringing up my hand to cover it up. No doctors appointments yet this week, however I will be calling Dr. Yee tomorrow for a consultation. This is the dentist that will preform my root canals. In other news, Matt has his artwork for sale in a new shop in Paia called Isle Empress. This will be a feature of the newsletter for Holton Gallery this month. Davida had a sweet Grand Opening yesterday. The shop has great art, amazing jewelry, and cool clothing. Matt's art is beautifully displayed, and he also has some necklaces, and a bracelet for sale there as well. More exposure! Weeeee! I guess you all must be watching the Super Bowl today. Who's playing again? Let me know how it turns out! The last time Matt & I were downtown we stopped by a pawn shop. Matt found a tool he can use for making frames, and I found this killer HJC helmet for the moped! I got it for a fraction of the price of a brand new one off the shelf. I love the red, black and silver, tattoo designs. The inside is like a comfy couch. I figured, I will be riding Matt's Vespa (it's red, so the helmet will match beautifully!) before I will be getting back on my Specialized bicycle, so why not buy this gem? It is practically new, and had only been in the shop for about 2 weeks. Presently our awesome mechanic Ed, is working on the scooter, and I told him we don't need it back until March. He is fixing the headlight, and a persistent squeaking sound that was getting progressively louder (a ball barring of some sort). Ed is so great, he came by and put the Vespa up in his truck bed, and drove it off. He has always been really cool and thoughtful when it comes to servicing the bike. Actually he is cool and thoughtful period. His wife Cathy makes yummy desserts, and I still think of that amazing pan of flan she brought me. Mmmmmm. The next purchase will be the bicycle helmet with face guard. Since it is made for a bicycle it will be a bit lighter than this beast of a helmet for the moped. 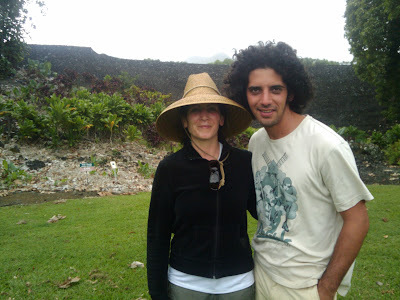 I always see people biking down Haleakala (which by the way I would never consider) with those types of helmets on. So the search is on! Any suggestions of good brands of bike helmets? The artwork behind me is in our backyard, on the back of our shed/garage. Matt's friend is a graffiti tagging artist, and Matt invited him to do this huge piece a few years ago. I am blocking the taggers name, Arise. I am indeed arising!